Aizawl Nov 7 : The Mizoram Boundary Committee headed by former minister C Chawngkunga today decided to submit an interim report on the findings on the Indo-Bangladesh border fencing in the Mizoram sector to the government. The committee, which met here, said that it would urge the government to ensure that construction companies followed the guidelines for border fencing by constructing it at 150 metre to 200 metre from the actual border. 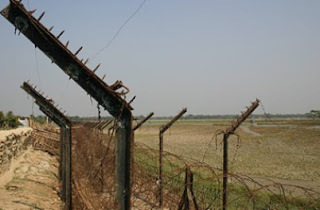 "In some places the fence was constructed at 500 metre from the border, causing immense loss of land to India," the Boundary Committee said, adding that 15 villages were fenced out while in 21 the fencing ran through the village in the southern part of the state. Those fenced out and also the villages where the fencing went through were practically deprived of land for cultivation by border fencing. The committee observed that the contractors working under the Union Home Ministry completely ignored the state government and did not consulted the district administration while undertaking the construction of the border fences.